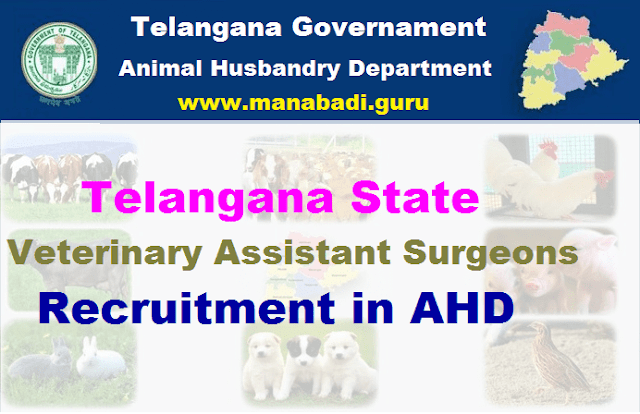 Government of Telangana Animal Husbandry Department is going to recruit fresher candidates in India for Veterinary Assistant Surgeon Posts on contract basis.The Government has accorded permission to the Director of Animal Husbandry, Hyderabad to fill up (101) clear vacancies of Veterinary Assistant Surgeon posts on contract basis for a period of 12 months as per guidelines. If need continues, fresh contract can be signed, based on performance, for another period not exceeding 12 months or fresh direct recruitment whichever is earlier. Govt. of Telangana, AH Dept. 101 Veterinary Assistant Surgeon Posts Recruitment and Last date to apply for this recruitment is 15.05.2017. Government of Telangana, Animal Husbandry Department invites application for the Post of Veterinary Assistant Surgeon on Contract Basis. B.V.Sc & AH degree awarded by any Veterinary University recognized by Veterinary Council of India.The candidate must be registered with Telangana Stale Veterinary Council. Merit list will be prepared based on the marks obtained in the qualifying examination. Filled in application shall be submitted in the Office of the Director of Animal Husbandry, Shantinagar, Telangana, Hyderabad on or before 15.05.2017.